Long before men awoke to the vision of America, the Old World was the scene of many stupendous migrations. One after another, the Goths, the Huns, the Saracens, the Turks, and the Tatars, by the sheer tidal force of their numbers threatened to engulf the ancient and medieval civilization of Europe. 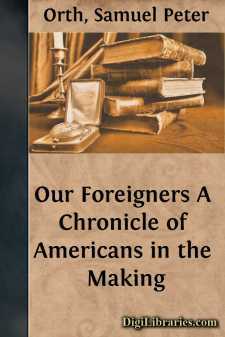 But neither in the motives prompting them nor in the effect they produced, nor yet in the magnitude of their numbers, will such migrations bear comparison with the great exodus of European peoples which in the course of three centuries has made the United States of America. That movement of races—first across the sea and then across the land to yet another sea, which set in with the English occupation of Virginia in 1607 and which has continued from that day to this an almost ceaseless stream of millions of human beings seeking in the New World what was denied them in the Old—has no parallel in history. It was not until the seventeenth century that the door of the wilderness of North America was opened by Englishmen; but, if we are interested in the circumstances and ideas which turned Englishmen thither, we must look back into the wonderful sixteenth century—and even into the fifteenth, for; it was only five or six years after the great Christopher's discovery, that the Cabots, John and Sebastian, raised the Cross of St. George on the North American coast. Two generations later, when the New World was pouring its treasure into the lap of Spain and when all England was pulsating with the new and noble life of the Elizabethan Age, the sea captains of the Great Queen challenged the Spanish monarch, defeated his Great Armada, and unfurled the English flag, symbol of a changing era, in every sea. The political and economic thought of the sixteenth century was conducive to imperial expansion. The feudal fragments of kingdoms were being fused into a true nationalism. It was the day of the mercantilists, when gold and silver were given a grotesquely exaggerated place in the national economy and self-sufficiency was deemed to be the goal of every great nation. Freed from the restraint of rivals, the nation sought to produce its own raw material, control its own trade, and carry its own goods in its own ships to its own markets. This economic doctrine appealed with peculiar force to the people of England. England was very far from being self-sustaining. She was obliged to import salt, sugar, dried fruits, wines, silks, cotton, potash, naval stores, and many other necessary commodities. Even of the fish which formed a staple food on the English workman's table, two-thirds of the supply was purchased from the Dutch. Moreover, wherever English traders sought to take the products of English industry, mostly woolen goods, they were met by handicaps—tariffs, Sound dues, monopolies, exclusions, retaliations, and even persecutions.